The Sacrament of Baptism - Holy Baptism is the basis of the whole Christian life, the gateway to life in the Spirit, and the door which gives access to the other sacraments. Through Baptism we are freed from sin and reborn as sons of God; we become members of Christ, are incorporated into the Church and made sharers in her mission: Baptism is the sacrament of regeneration through water in the word. A Baptismal workshop (held quarterly on a single Saturday in January, April, July, and October) and an interview with a Deacon is required. Contact the Parish office for more information and to schedule a Baptism. The Church also requires that a Godparent for Baptism and a Sponsor for Confirmation be an active Confirmed Catholic. An active Catholic is a parishioner who is registered, attends Mass weekly, is in a valid Catholic marriage, and publicly leads a life compatible with Church teaching. 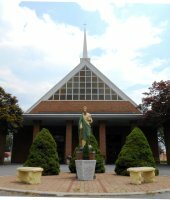 You will need to have the Sponsor Form (Click here) completed if your Godparents are Catholic and not a member of St. Jude The Apostle Church. If one of your Godparent is not Catholic, then please have them complete the Christian Witness form (Click Here). Please return the completed forms to the Parish Office. If you have been asked to be a Godparent, then please complete the Sponsor Form and return it to the Parish Office for Signature and the Parish Seal.